I had hoped to share my finished socks with you today, sadly I got distracted and didn't do the other heel on my socks. I had plenty of time to finish my sock, but like I said, I got distracted. I got distracted by pretty things. 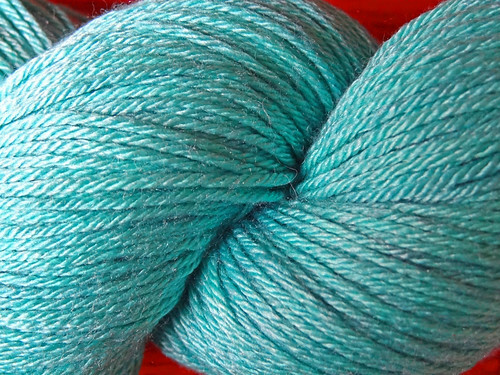 This yarn is 50% Falkland merino and 50% silk and it is gorgeous. The colour in the above photo isn't perfect, this one is a little closer to the truth. This shade is one of my favourites, and as soon as I saw it I had to buy it. It's hard to get this precise colour for some reason, and there was a 10% discount on the store, until 28th February (so there's time to get your own), so I had to buy it. I KNOW you understand! When the yarn arrived I just wanted to knit with it straight away. This is unusual for me because I usually want to live with a yarn for a while, getting to know it, before I start swatching. 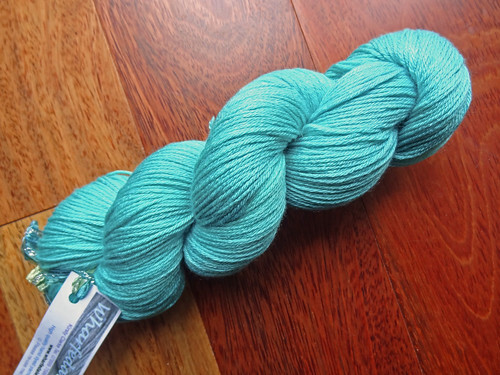 This yarn demanded to be knit straight away, so I spent yesterday charting merrily for a lace scarf that uses this yarn. I am itching to cast on, so I can imagine myself doing so today. I have been too long without lace to knit and it's driving me crazy. Who knew I would end up so addicted to lace! Another distraction that arrived yesterday was something I bought for myself using Christmas money and my savings as a very early birthday present to myself. I've got another 2 months to go, but I just couldn't wait any longer. If you follow me on Instagram, Facebook or Twitter you will probably have already seen this snap. Yup, I got the full ChiaoGoo Interchangeable Lace Needle set. It fills me with horror when I think about how much this set cost at £105, but I LOVE these needles and as I will spend a great deal of time every day using them, I think it was worth it. 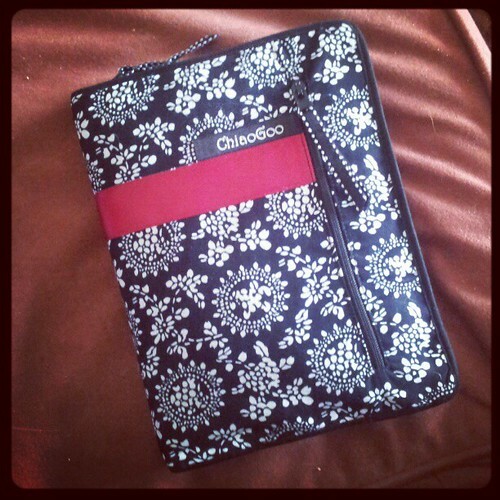 Not only are the needles great to use but the case is really pretty too. I'll do a proper review next week, with better photos. With the giveaway that I ran as part of the Knotted Cap KAL came a set of stitch markers. AnnaLeslie wanted green markers and my bead collection was sadly lacking in that particular colour, so I ordered some from Spellbound Beads. I've been to this shop in person and visited their stand at various shows and I can spend hours looking at all their sparkling goodies. I, of course, couldn't just buy beads for the stitch markers so some extra beads just for me made their way into the basket. 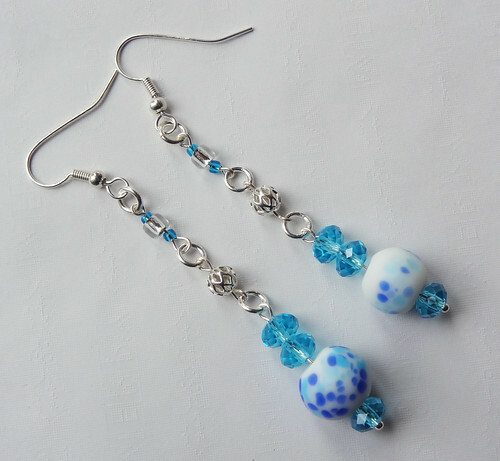 After making the stitch markers and posting them off with the rest of the prizes I made some earrings with my new beads. Aren't they pretty? They are about 3.5" long and made in four parts. I made these earrings nice and long so they peek out below my hair when it hangs loose, rather than tucked behind my ears. The four parts are joined together with split rings and each section is held together by handmade eyepins, with the bottom section supported by an headpin. 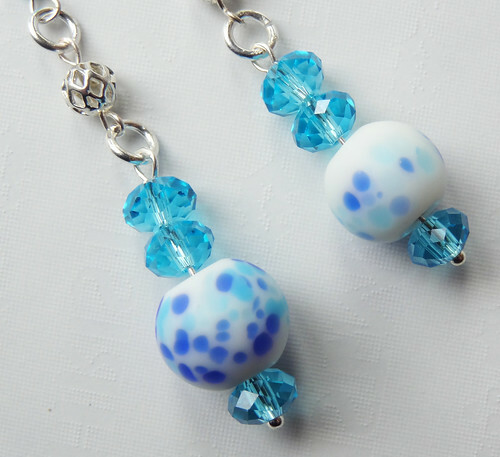 The bottom section is my favourite because of the contrast between the matte painted ceramic bead and the blue crystals. I still have quite a few of both of these beads and I'm tempted to play with them some more, as making these reminded me of how much I enjoy working with beads, wire and pliers! So I hope you are not disappointed by the lack of socks, but instead have enjoyed my pretty distractions. 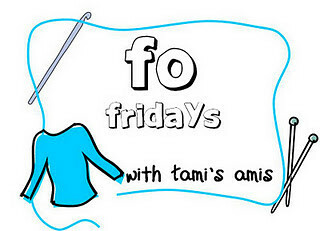 To see finished projects of a more fibrous nature, click on the button.